Charlotte, NC is host to NC’s End the Fed Part II Rally on November 24 at 12pm. 530 East Trade St. Charlotte, NC. 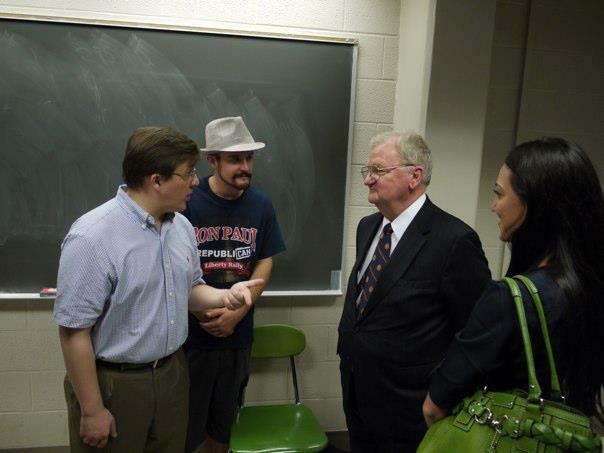 Morton Blackwell, President of the Leadership Institute and senior member of RNC rules committee, author of the minority report (a counter-measure to the controversial rule changes), goes on the record in a conversation with Carolina Liberty PAC about the 2012 Republican National Convention. -the NC delegation meeting, NC chairman Robin Hayes, and more. “Fire Janet Cowell” – Treasurer’s Record Too Sensitive for Facebook? “[W]e know from history that Janet Cowell has some ‘pay-to-play’ friends in high places, including a member of the Facebook board of directors who probably directed Cowell to invest the NC State employee pension fund into the Facebook IPO in the first place. This stinks to high heaven! Carolina Liberty PAC inquired with another page creator, David Williams, about whether facebook had provided an explanation for the removal of the two pages. “Sadly, [Facebook] has provided no explanation whatsoever. I wrote a couple of emails, one to their marketing department. I also called them but it is well nigh impossible to get an actual human being,” Mr. Williams replied. A national financial rating report was recently released by the Institute for Truth in Accounting in which it was revealed that North Carolina’s financial rating DROPPED 4 PLACES from 31st to 35th in the nation. 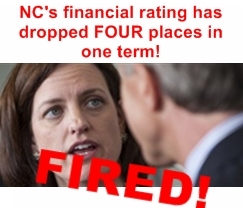 One thing that impacted NC’s rating drop was our state’s level of unfunded liabilities, such as the state employees’ pensions, that have been negatively affected by the inappropriate investments of our current treasurer. North Carolina is now on the path to receive a drop in our credit score. $26 million was recently invested from the state employees’ pension fund into the FACEBOOK IPO: an inappropriate investment that cost North Carolinians millions! Tell Janet Cowell she is FIRED! Records from the National Institute on Money in State Politics show that Cowell’s 2012 campaign has received more money from out of state sources than from North Carolina backers, and in 2008 she received $225,000 in New York-based contributions alone. Why so much financial support from far-away places? 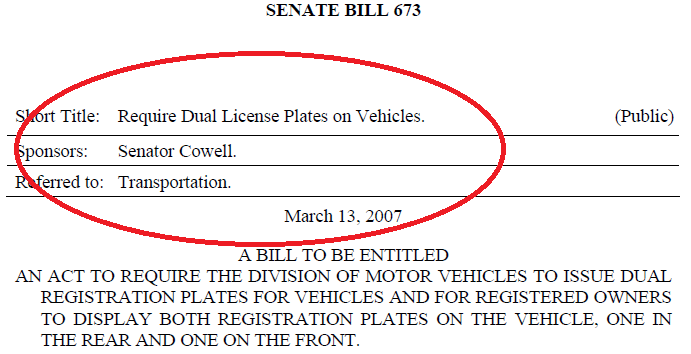 Janet Cowell, responsible for introducing a bill to require that all vehicles in NC are fitted with front license plates. NC does not need a treasurer who demonstrates such a lack of concern with FISCAL IMPACT, such as proposing bills that would impose costly mandates on the people of NC with no real benefit. Once again, out of touch with the people of NC. “The first major obstacle of the new bill is the outright cost of supplying and additional 8.4 million addition plates for the vehicles already in use. That money will have to be pulled from the budget, or will have to be paid for directly to the DMV. This means less money for constructing I-540 and other road improvement projects. Many car owners will be opposed to the bill because of the cosmetic damage caused to their car. Many cars are not fitted with brackets for forward plates, meaning one would have to be retrofitted to the car, or holes will have to be drilled directly into the bumper. This may not be a big deal for your average car owner, but imagine drilling two holes in the carbon fiber bumper of your 300,000 dollar Lamborghini. Not only does it cause damage to the car, but most people will agree the front plates are unsightly at best. The benefits to law enforcement are extremely low. The plates can not be seen at night due to the fact that no cars have forward mounted plate illumination lights. A police officer looking in his rear view mirror during the day at the car behind him will see the letters backwards, making the plate useless. Driving past the officer, the front plate can easily be obscured by other motorist. *note: article was edited in order to correctly attribute a quote. NC State Treasurer’s Race: Janet Cowell, the Democratic candidate, invested $26 million from the state employees’ pension fund into the facebook ipo, immediately losing over 4 million, with many millions more projected as an eventual loss from the investment. Note that the only reason this information on the investment is publicly known is that it was detailed in court documents. You see, Cowell later signed North Carolina up to participate in a class action lawsuit against facebook for the loss. Janet Cowell appears to have later engaged in “pay-to-play” cronyism by suggesting a law firm out of NY (Bernstein Litowitz Berger & Grossman) represent NC in the class action lawsuit, rejecting the use of five other “firms specializing in securities litigation to bring class-action suits against firms that engage in securities fraud,” (http://www.ncinsider.com/2011/10/05/116970/pension-litigation.html). Why would our state treasurer take special effort to ensure that NC hires a law firm out of New York to represent North Carolina in a lawsuit? A review of Cowell’s campaign reports indicate that her campaign has received over $72,000 in campaign funds from employees of the NY law firm since 2008! 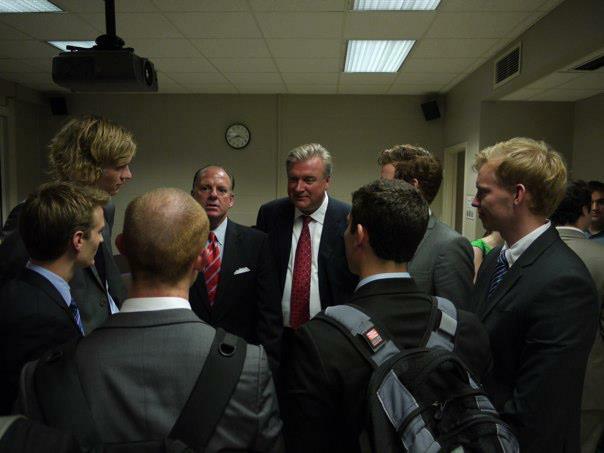 Monday, October 15, 2012: Carolina Liberty PAC was guest to a standing-room only discussion on socialism in Denmark, presented by the founder/CEO of a Danish investment bank, Lars Christensen. The presentation had the overall feel of a dire warning to Americans not to follow in the path of Denmark. One of the most entertaining anecdotes to illustrate the point of how unfair a socialistic society is to the working class was that of the “no poor people in Denmark” debacle. Last year, the far left party of Denmark was making an argument for increasing entitlements, which essentially entailed: give more entitlements to the poor and it will help them to get educated, get into the workforce, and eventually be on their feet and independent of the excess entitlements. Joachim Olsen, member of the right-wing party of Denmark, claimed (via a public facebook post) that there are no poor people in Denmark. This argument was countered by Ozlem Cekic of the leftist party. Mr. Olsen asked Ms. Cekic to find a poor person in Denmark, and a very public challenge was initiated. Carina, a 31 year old single mother of two children, one of whom lives at home with her, has qualified for government welfare since she was 16, and was still collecting entitlements at the time of the interview because of a psychological condition of anxiety, which she claims prevents her from working. She hoped to soon qualify for permanent disability, though she had no actual physical ailment. Upon review of Carina’s budget, it was discovered that she receives over 15,728 kroner per month. In American dollars, it is currently equivalent to over $2,700 per month. After her monthly bills which include rent, utilities, internet, pet food & vet bills, private soccer lessons for her child, healthcare, cigarettes, and personal debts, she had only 5,000 kroner left for food, clothing, and housekeeping (or $880 American)! Sounds like a terrible life for the unemployed, right? Mr. Olsen concluded that if Carina had no money for shoes, it was due to poor budget management rather than lack of funds. This publicized debate was a real wake-up call for many Danish viewers, who realized that an unemployed woman, considered to be among the poorest of the poor in Denmark, has more take-home pay than many of the blue-collar employees upon whose tax dollars she relies. Also present were NC Liberty State House Rep. Glen Bradley, ConstitutionalWar.org’s Chuck Suter, and Leadership Institute President Morton Blackwell, who had friends among the NC liberty folks, as we previously got to know him during a North Carolina delegation meeting at the RNC in Tampa, in which he was present to give his opinion on RNC rule changes (as a senior member of the RNC rules committee). 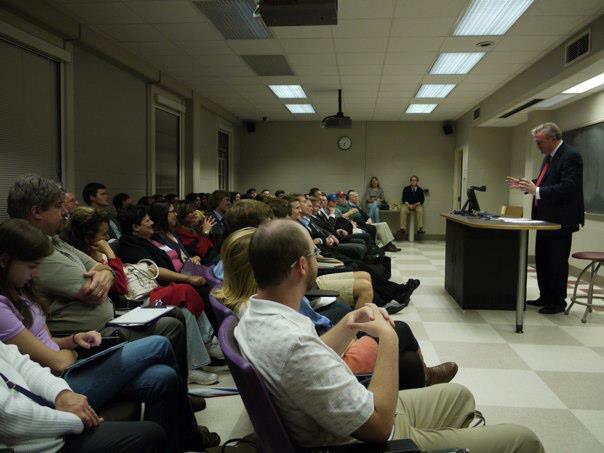 Thanks to Terry McIntyre and Craig Holland Dixon for the photography, and to the Leadership Institute for having us! 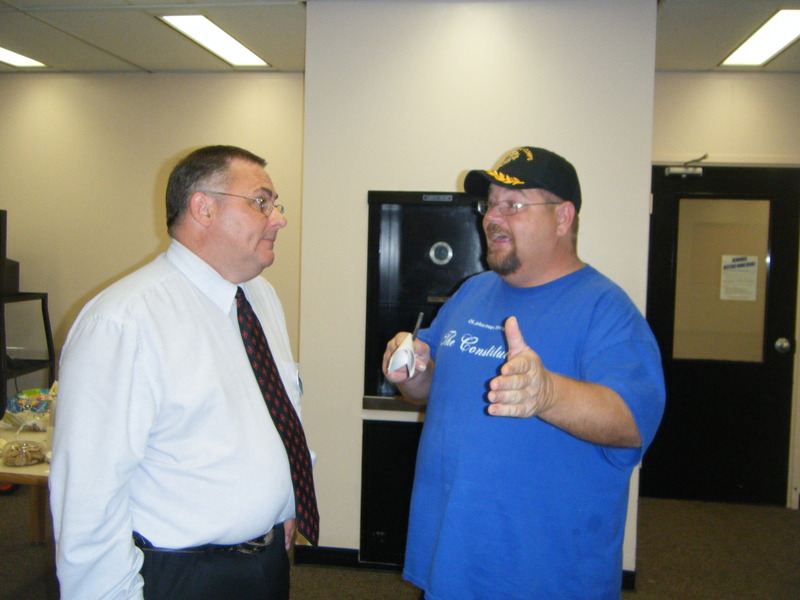 A forum was held in a joint effort between the Caldwell Patriots and Carolina Liberty PAC to learn more about the candidates running for the Caldwell County Board of Education. Carolina Liberty PAC thanks the candidates Rob Bratcher, Charles Woodie, Bob Henson, and Annette Caldwell-Swanson for attending and engaging in straight-forward discussion about the issues that the school board will be facing. 4) Earlier this year, the topic of social matters within the school curriculum was raised pertaining to the North Carolina constitutional amendment on marriage. 5) Some of the council of state candidates are advocating a new plan for North Carolina high schools, which entails splitting the high schools into two different curriculum paths. High school freshmen will then choose between a higher education curriculum, or a vocational education curriculum for the rest of their high school career. 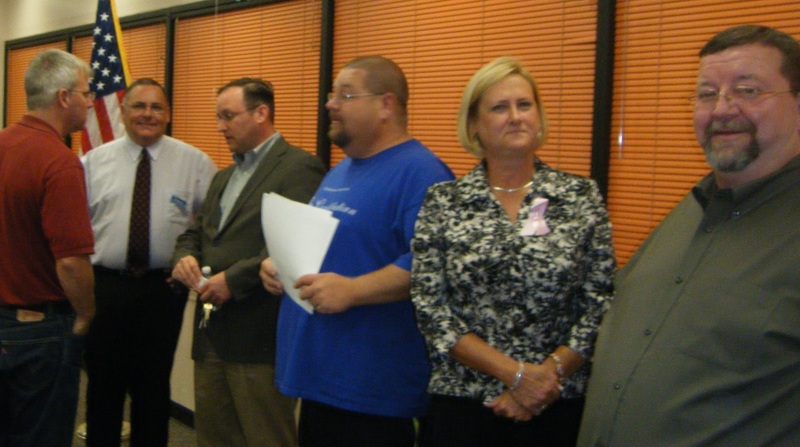 Caldwell county school board candidates forum from Homegrown Television on Vimeo. A parent asked the candidates about a practice implemented during the former school board term, which entailed sending political information home with children, for the purpose of pushing the political agenda of a 1 cent sales tax increase on North Carolina residents. The candidates explained where the decision to send the information home to parents stemmed from, and their own stance on mixing political agendas with school resources. 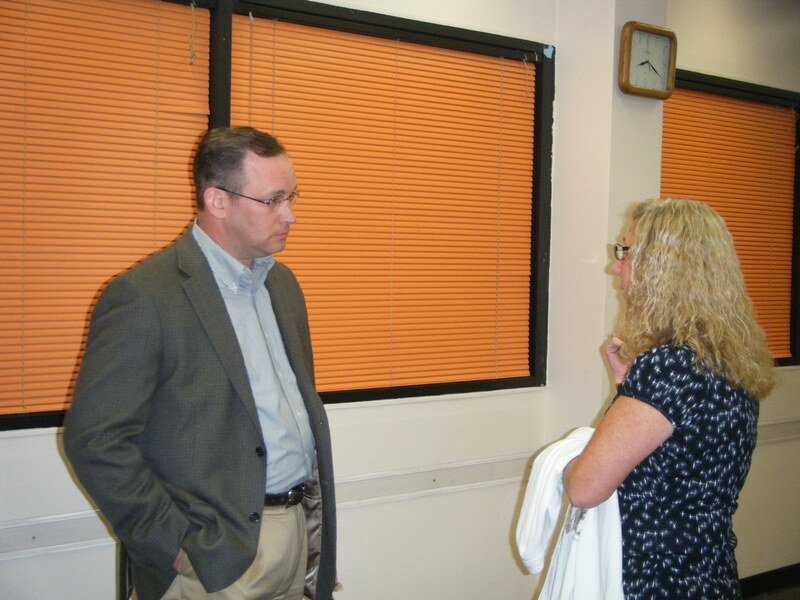 The parent expressed disappointment that there were no incumbent school board members present to address the question. A question was asked about the candidates’ stances on teachers unions and collective bargaining. A question was asked pertaining to the reason for a decision to eliminate contests for valedictorian/salutatorian. An audience member asked a question pertaining to the idea of revolutionizing curriculum on a local level, tailored specifically to our county rather than stemming from DC/Raleigh curriculum. Discussion broke out over the level of sovereignty that a local school board has, and strings attached to receiving funds from state/federal levels. A student brought up a point about the teaching styles having a bigger impact on the students’ education than does the curriculum itself. The forum closed out with candidates giving a short summary of what they will bring to the school board of Caldwell County.